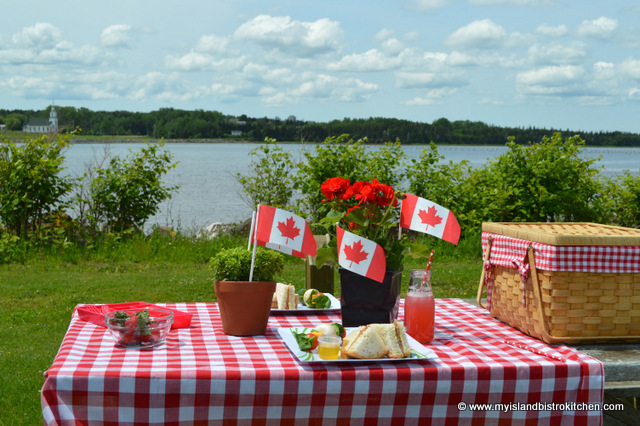 One of our usual Canada Day traditions is to go on a red-themed picnic. 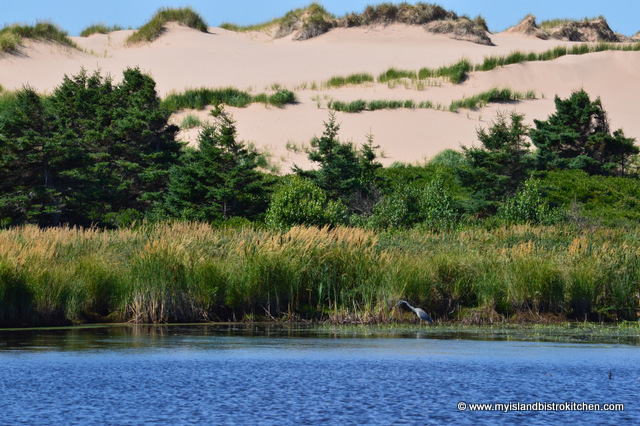 This year, we headed East to the Greenwich National Park, not far from St. Peter’s Bay. I have been to this park several times before and am always awestruck by its natural beauty. 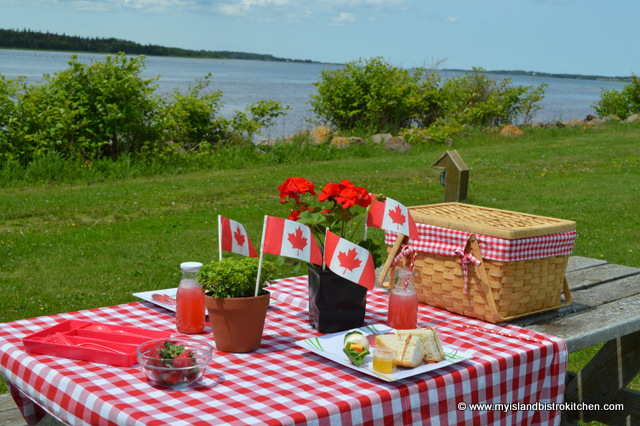 Before I share photos of our Canada Day picnic, I thought you might like to see photos of the beauty that is Greenwich. From the parking lot, the trek on the path through the fields and woods and out over the floating boardwalk to the magnificent beach and back is about 5 km. It’s mostly flat terrain (except for a very short jaunt through the woods) and, for the most part, easy walking. The only hitch is that you have to share nature with the mosquitoes on the walk on the trail through the field and the woods to reach the boardwalk so, if you head to Greenwich, be sure to bring along some insect repellent to make the experience more enjoyable. Depending on the weather, some sunscreen is also advised. It’s also a good idea to bring along some water to stay hydrated. 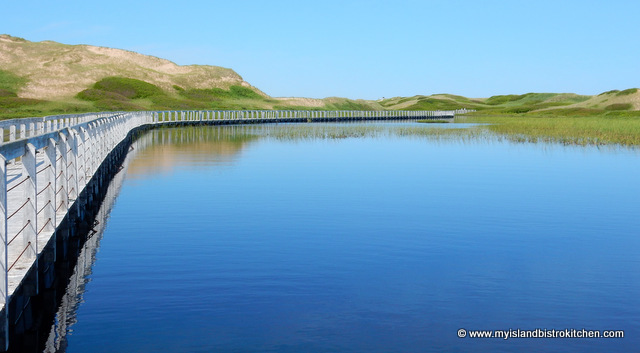 The photo you see above is a typical scene along the floating boardwalk at Greenwich National Park. The pink sand dune in the background is all the work of Mother Nature. 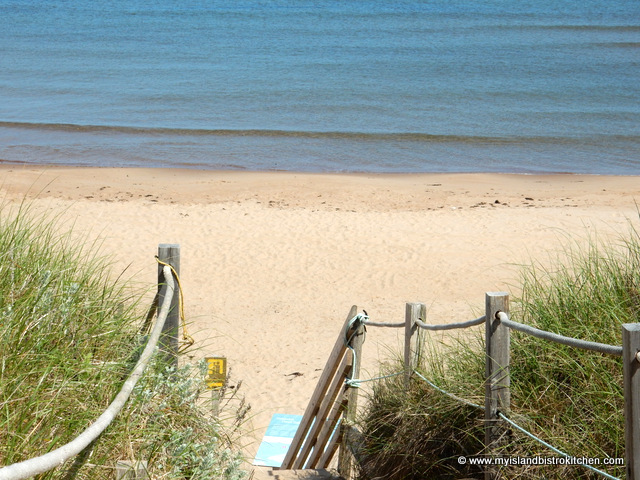 At the end of the boardwalk, you arrive at the magnificent beach shown in the photos below. You won’t find a finer beach anywhere than this one at Greenwich. I always refer to it as the perfect, unblemished jewel amongst our system of national parks on the Island. 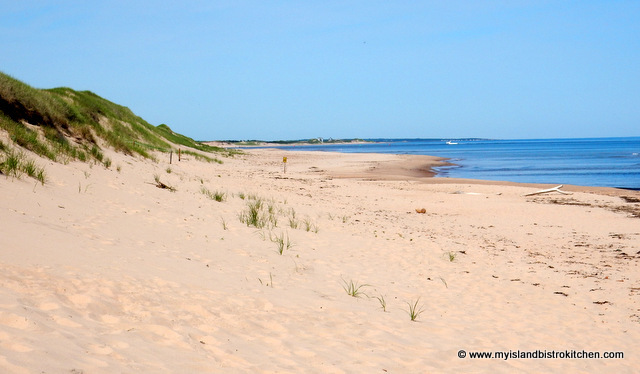 During lobster fishing season, and from the vantage of this beautiful beach, it’s not uncommon to see the fishing boats returning from the Gulf of St. Lawrence to the nearby harbour with their catch of the day. Apart from the scenery, one of the wonderful aspects of Greenwich National Park is the variety of wildlife and birds. 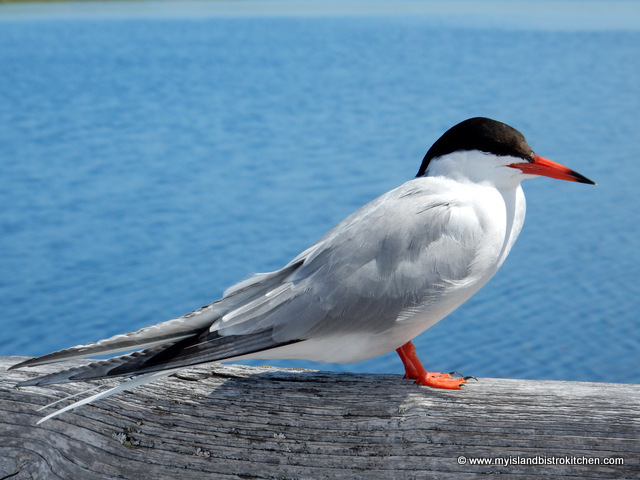 Some, like the Common Tern below, are quite willing to pose for photos! 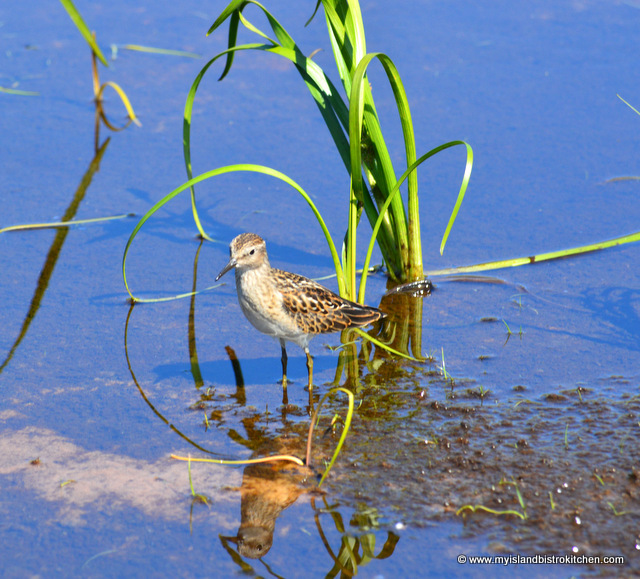 The little Sandpiper below chose a lovely natural backdrop for its portrait! 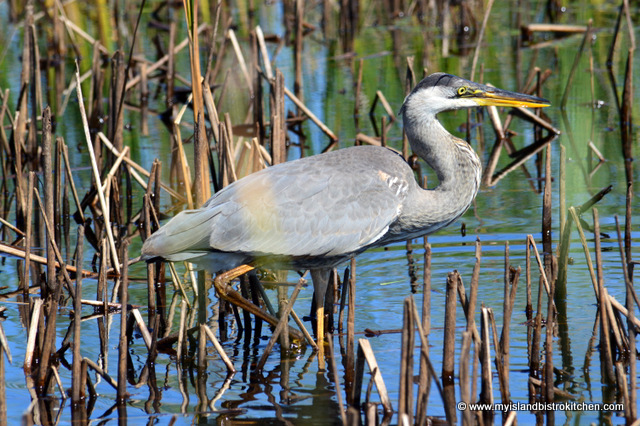 Blue herons, common to PEI, are often seen in and around the waters between the sand dunes at Greenwich. These are but a few of the many different kinds of birds often sighted at Greenwich so a leisurely walk on the boardwalk between the dunes offers a great opportunity for bird enthusiasts. By the time we had finished our morning hike through Greenwich, we had worked up an appetite. I had packed a simple picnic lunch and made sure it was stowed in an insulated cooler with lots of ice packs because temperatures soared to 28°C on Wednesday. I use my traditional non-insulated picnic basket (shown in the photo below) to transport non-perishables. On the way to Greenwich through St. Peter’s Bay, I had noticed a small park with picnic tables by the water. I thought, even though the lighting for photography may not have been the best, this would be a good spot for our picnic. 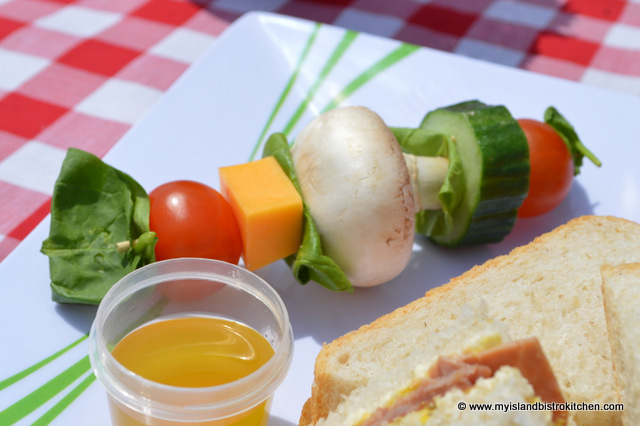 My picnic menu was not elaborate and was quick and easy to pull together. 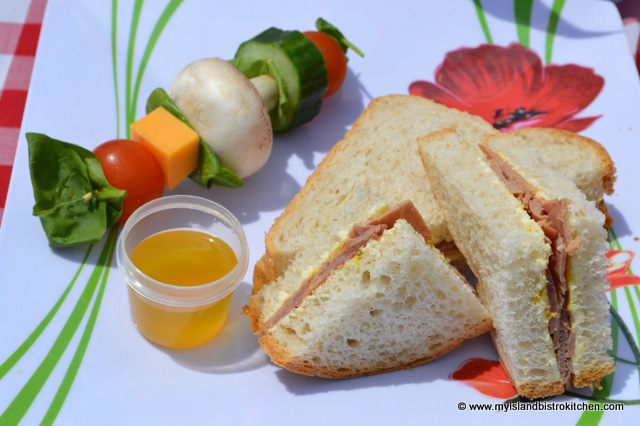 Ham sandwiches on oat bran bread were the main feature accompanied by salad on a stick with small individual containers of vinaigrette for dipping the vegetables. Any combination of vegetables and cheese can be selected for threading on to the skewers. This is a simple way to serve salad ingredients and can be prepared before leaving home. 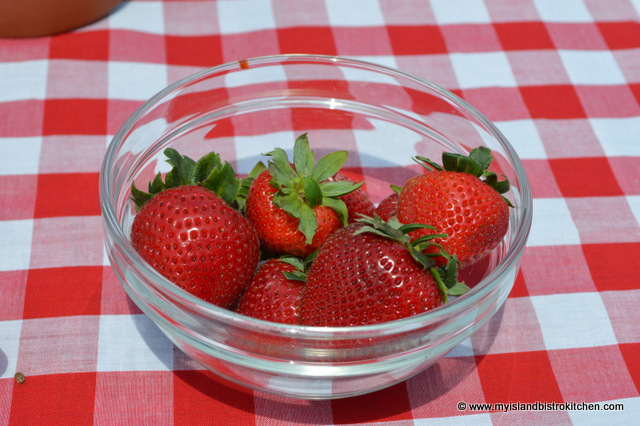 It also cuts down on the number of containers of ingredients that need to be transported to the picnic site as well as dirty salad bowls to have to bring back home. I try to pack as minimally and efficiently as I can because I’m never certain how far I might be parked from the picnic table site. 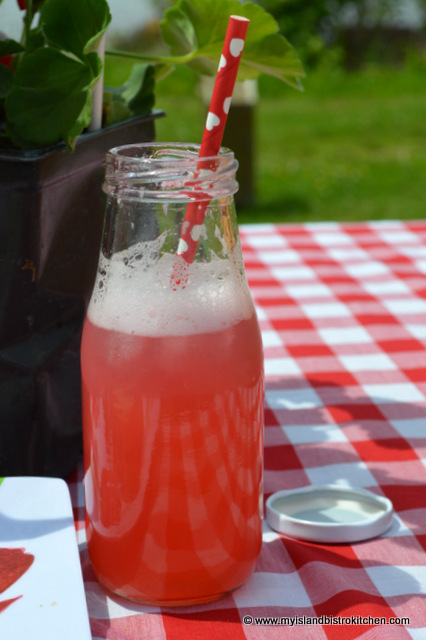 I had just made a fresh batch of rhubarb cordial so that was our red beverage which I served in these cute little glass milk bottles along with red and white straws. I like small pots of herbs because I can use them in many ways and, while we do have a small in-ground herb garden, I also keep a number growing in pots over the summer. The benefit of having some herbs in pots is that they can be transported to wherever they are needed. I often use them as table centerpieces because, as well as being decorative, they can also be clipped and used to flavour food. In the case of our picnic, the basil was used to flavour the vinaigrette. 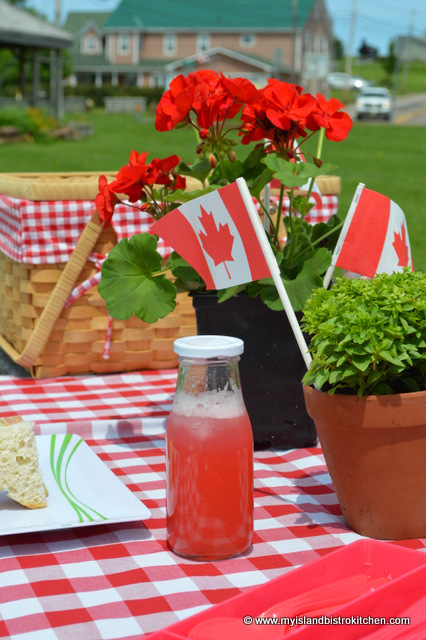 This was how we celebrated Canada Day 2015. 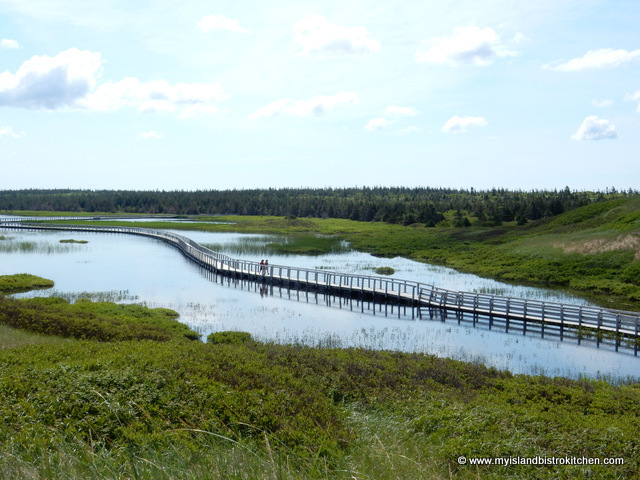 I hope you have enjoyed this brief photo tour of PEI’s Greenwich National Park, a unique natural treasure we Islanders are lucky to have in our midst. If you live on PEI, or have the opportunity to visit the Island, I hope you will travel to Greenwich and experience its beauty for yourself. 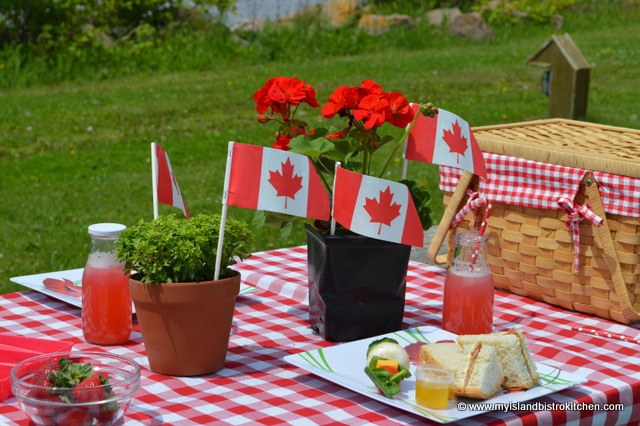 To view previous postings of our Canada Day celebrations in years past, click on the following links: 2012, 2013, and 2014. If you enjoyed this posting, please share it on your social media sites.